Nouriel Roubini, Professor at NYU’s Stern School of Business and Chairman of Roubini Global Economics takes a look ahead at what awaits us in 2013. US fiscal policy, the Eurozone, the BRICs, China and the Middle East are all giving cause for worry. NEW YORK – The global economy this year will exhibit some similarities with the conditions that prevailed in 2012. No surprise there: we face another year in which global growth will average about 3%, but with a multi-speed recovery – a sub-par, below-trend annual rate of 1% in the advanced economies, and close-to-trend rates of 5% in emerging markets. But there will be some important differences as well. Painful deleveraging – less spending and more saving to reduce debt and leverage – remains ongoing in most advanced economies, which implies slow economic growth. But fiscal austerity will envelop most advanced economies this year, rather than just the eurozone periphery and the United Kingdom. Indeed, austerity is spreading to the core of the eurozone, the United States, and other advanced economies (with the exception of Japan). Given synchronized fiscal retrenchment in most advanced economies, another year of mediocre growth could give way to outright contraction in some countries. With growth anemic in most advanced economies, the rally in risky assets that began in the second half of 2012 has not been driven by improved fundamentals, but rather by fresh rounds of unconventional monetary policy. Most major advanced economies’ central banks – the European Central Bank, the US Federal Reserve, the Bank of England, and the Swiss National Bank – have engaged in some form of quantitative easing, and they are now likely to be joined by the Bank of Japan, which is being pushed toward more unconventional policies by Prime Minister Shinzo Abe’s new government. Moreover, several risks lie ahead. First, America’s mini-deal on taxes has not steered it fully away from the fiscal cliff. Sooner or later, another ugly fight will take place on the debt ceiling, the delayed sequester of spending, and a congressional “continuing spending resolution” (an agreement to allow the government to continue functioning in the absence of an appropriations law). Markets may become spooked by another fiscal cliffhanger. And even the current mini-deal implies a significant amount of drag – about 1.4% of GDP – on an economy that has grown at barely a 2% rate over the last few quarters. Second, while the ECB’s actions have reduced tail risks in the eurozone – a Greek exit and/or loss of market access for Italy and Spain – the monetary union’s fundamental problems have not been resolved. Together with political uncertainty, they will re-emerge with full force in the second half of the year. After all, stagnation and outright recession – exacerbated by front-loaded fiscal austerity, a strong euro, and an ongoing credit crunch – remain Europe’s norm. As a result, large – and potentially unsustainable – stocks of private and public debt remain. Moreover, given aging populations and low productivity growth, potential output is likely to be eroded in the absence of more aggressive structural reforms to boost competitiveness, leaving the private sector no reason to finance chronic current-account deficits. Third, China has had to rely on another round of monetary, fiscal, and credit stimulus to prop up an unbalanced and unsustainable growth model based on excessive exports and fixed investment, high saving, and low consumption. By the second half of the year, the investment bust in real estate, infrastructure, and industrial capacity will accelerate. And, because the country’s new leadership – which is conservative, gradualist, and consensus-driven – is unlikely to speed up implementation of reforms needed to increase household income and reduce precautionary saving, consumption as a share of GDP will not rise fast enough to compensate. So the risk of a hard landing will rise by the end of this year. Fourth, many emerging markets – including the BRICs (Brazil, Russia, India, and China), but also many others – are now experiencing decelerating growth. Their “state capitalism” – a large role for state-owned companies; an even larger role for state-owned banks; resource nationalism; import-substitution industrialization; and financial protectionism and controls on foreign direct investment – is the heart of the problem. Whether they will embrace reforms aimed at boosting the private sector’s role in economic growth remains to be seen. Finally, serious geopolitical risks loom large. The entire greater Middle East – from the Maghreb to Afghanistan and Pakistan – is socially, economically, and politically unstable. Indeed, the Arab Spring is turning into an Arab Winter. While an outright military conflict between Israel and the US on one side and Iran on the other side remains unlikely, it is clear that negotiations and sanctions will not induce Iran’s leaders to abandon efforts to develop nuclear weapons. With Israel refusing to accept a nuclear-armed Iran, and its patience wearing thin, the drums of actual war will beat harder. The fear premium in oil markets may significantly rise and increase oil prices by 20%, leading to negative growth effects in the US, Europe, Japan, China, India and all other advanced economies and emerging markets that are net oil importers. While the chance of a perfect storm – with all of these risks materializing in their most virulent form – is low, any one of them alone would be enough to stall the global economy and tip it into recession. And while they may not all emerge in the most extreme way, each is or will be appearing in some form. As 2013 begins, the downside risks to the global economy are gathering force. 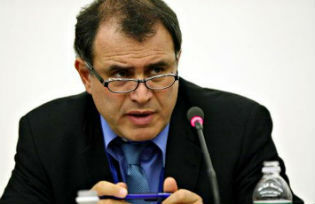 Nouriel Roubini, a professor at NYU’s Stern School of Business and Chairman of Roubini Global Economics, was Senior Economist for International Affairs in the White House’s Council of Economic Advisers during the Clinton Administration. He has worked for the International Monetary Fund, the US Federal Reserve, and the World Bank.